Architects and structural engineers design buildings with concrete blocks (also known as concrete masonry units, or CMUs) for a number of important properties: high structural capacity, resistance to fire, resistance to water, variety of aesthetic possibilities and insulating and acoustical advantages. In many cases, this minimum-maintenance material may provide the most economical way to meet certain requirements of building codes or the specialized needs of a client. ASTM International's Publication C140 - 09a, "Standard Test Methods for Sampling and Testing Concrete Masonry Units and Related Units," insures that each concrete block meets minimum design expectations. A concrete block wall provide many desirable properties with economy. While concrete blocks vary by type, their primary structural property is compressive strength. The American Concrete Institute's (ACI) Publication 318, "Building Code Requirements for Structural Concrete," contains the structural property standards for concrete and 7-day and 28-day testing methods used to insure that the concrete blocks manufactured meet or exceed building codes throughout the United States. ACI's 228.1R-03, "In-Place Methods to Estimate Concrete Strength," outlines the standard in-place strength tests that estimate concrete strength during construction or estimate concrete strength during the evaluation of existing concrete block structures. Inserting rebar (steel rods) into the cells (the openings in blocks--most blocks have holes for ease of construction) or solid grouting the cells produces a significantly stronger concrete block. Permeability and porosity vary by unit type, but generally concrete blocks absorb water. A mixture of coarse and fine particle material during manufacture produces a significantly more waterproof concrete block wall. The amount of cement used in the manufacture of concrete blocks affects the block's permeability; a mixture rich in cement produces a less permeable block. Facing the blocks with a mixture of cement and fine sand, using waterproof compounds during manufacture or applying one of the various washes available after erecting the blocks prevents the penetration of water. Fireproof properties vary by coverage area and unit type. ACI's 216.1-97/TMS 0216.1-97, "Standard Method for Determining Fire Resistance of Concrete and Masonry, Construction Assemblies," provides information on the fire-resistance rating, sometimes called the fire rating, of concrete blocks. 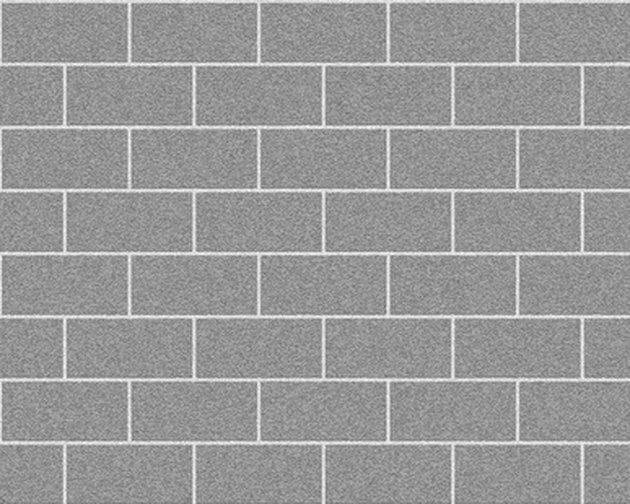 This document contains various tables that include the fireproof values for the various aggregate-type concrete blocks, utilized in restrained or unrestrained conditions, and their corresponding fire ratings. Utilizing concrete blocks in any building design significantly increases its fire code rating. The aesthetic properties of concrete blocks, once utilitarian and gray, have become more important. Concrete block manufacturers now produce concrete blocks in a wide range of colors, textures and finishes that architects utilize to great effect, depending on the building design. Concrete block manufacturers develop new concrete block shapes and sizes to meet an ever-evolving construction market. The insulating properties of various concrete blocks vary by manufacturer, and are dependent on the density of the block. Thermal conductivity tests performed by manufacturers determine the insulating properties. By reducing the concrete block density by volume and producing a lower-weight block, manufacturers increase the heat-insulating properties of the blocks. Solid grouting the cells of concrete blocks increases the insulating properties of a concrete block wall. The acoustic properties of any concrete block structure depend on the form of construction, the junctions and connections between the blocks and the properties of the materials used during manufacture of the blocks. Following concrete block installation recommendations as provided by the ACI and other organizations significantly increases acoustic control within the building. What Is a CMU Wall? What Is the Difference Between Type S & Type N Mortar Mix?